The profession of herbalism requires clinical competence, fantastic field skills and a balanced combination of intuition and science. Erin embodies all of these in her botanical medicine work. The nourishing infusions workshop today was a very valuable investment- worth every penny in fact. 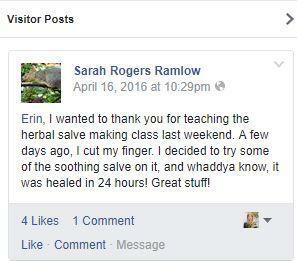 I gained a wealth of knowledge, new skills, as well as brought home several herbs and some very versatile skin cream. 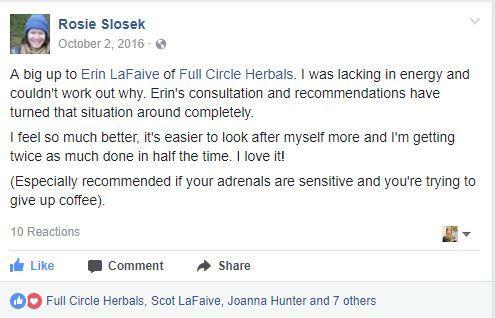 Erin, is an amazing teacher. She communicates well, she is very easy to listen to and understand, and her educational training and life experience shine through as she teaches others. I look forward to anther workshop in the future, and I am thankful for the time I spent with like-minded individuals today.